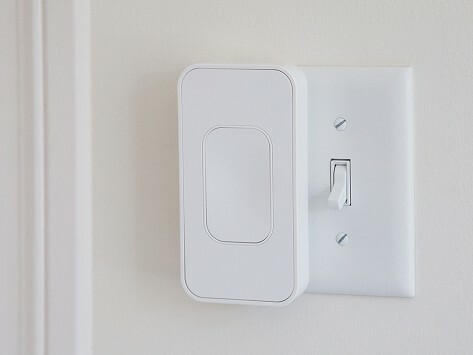 Automate your light switches in just a couple of minutes. Intuitive and easy to install, Switchmate instantly attaches magnetically to existing toggle and rocker switches, letting you control your lights from your smart phone. Use your phone to turn the lights on from the driveway. Double check that they’re off when you leave. And if you want to turn your lights on and off manually, you still can. Dimensions: 4.9" x 2.5" x 1"
Product was easy to program to turn outdoor lights on/off. No need to rewrite the lights! Just magnetically stick it to the light switch, download the app and after an easy setup you're in business. Boom boom, out go the lights. The Solution I've been Looking For! Instantly automate your lights and fans without having to change your light bulbs or re-wire your home. Place Switchmate over any toggle or rocker switch, then download the companion app to control the switch via Bluetooth. It’s an easy induction into the smart home lifestyle. 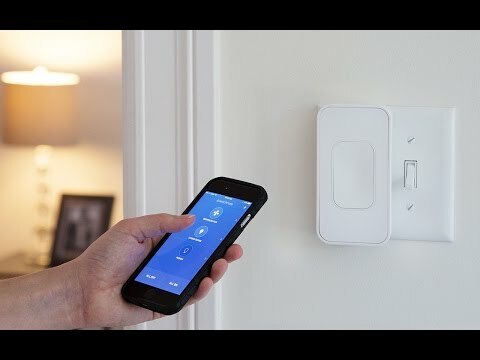 With Switchmate, lights can automatically turn on as you arrive home or enter rooms, and timers allow you to set your lights to go automatically on or off while you’re away. There’s a robotic arm inside Switchmate that responds to the app—moving the switch for you. We like that it also lets you press your switches on and off by hand, too, if you like. Add anyone you want in the family and let them control Switchmate as long as they’re within Bluetooth range. Turn the lights off from the couch when you fire up Netflix. Snap off the lights from bed. Or just have a lit up house greet you from the driveway. It’s all in the palm of your hand.